Providing you the best range of smt pcb reflow soldering machine and lead free smt reflow soldering machine with effective & timely delivery. We are widely recognized as one of the trusted trading, importing, exporting and supplying of premium quality Smt PCB Reflow Soldering Machine. The demand of offered refurbished machines are at peak as these are made utilizing quality approved metal and modern machinery. After the completion of the production process, our vendors make these machine pass a quality check so as to ensure their synchronization with established quality standards. 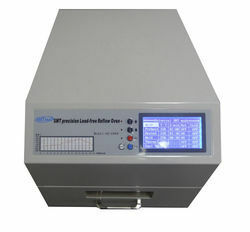 Clients can avail from us a wide assortment of Lead Free Smt Reflow Soldering Machine that is procured from some of the certified vendors of the market. Looking for Smt Soldering Machine manufacturer ?